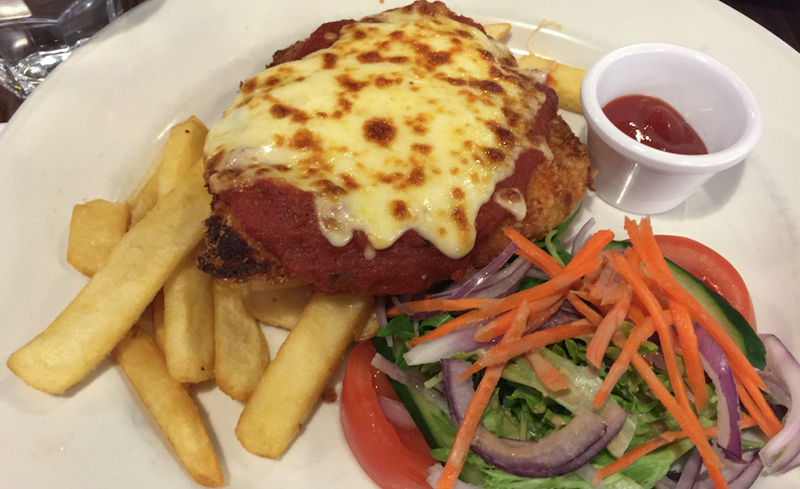 The Wood 'n Chimney has been on our radar for a while now, when word came through the grapevine that they were offering a $15 parma special (with a selection of novelties) all day, every day it was definitely time to poke our heads in. Located inside Melbourne Central, Directly across from the Central Lion and about 5 steps from the Hoyts cinema box office, The Wood n Chimney is a handy spot to know about if you ever find yourself peckish before/after hitting up a movie ... so lets just hope that the parma is good! We arrived on a Wednesday evening a little earlier than usual, easily finding a table at about 6:30pm, however that changed damn quickly - by 7 o'clock the place was packed, and walk-ins were being told there would be a 20 minute wait for a table. The Wood 'n Chimney is in the spot where Groove Train used to be, and if you ever went to Groove Train you should know exactly what to expect when visiting. I honestly think that the only thing they did when taking over the business was change the sign out front, as the decor is exactly the same as it what when it was Groove Train, I even saw the word "Groovy" a couple of times in the scrawled text on the wallpaper. Why they would even bother putting the $18.90 parma on the menu is beyond me, when it is available for $15 all. the. time. To mix it up a little Reviewer Nikki went for the traditional, while I opted for the Mexican. I ordered a Fat Yak from the drinks menu before realising they had Cricketer's on tap, cursing myself for not being more observant (especially seeing it was Happy Hour from 3 - 7 offering $14 jugs, and I just shelled out $9 for a stubby). Even though the place was pumping by this point, the food arrived rather promptly. The schnitzel looked rather small when the plate first hit the table, luckily this was deceptive as it thickened out to a damn decent size of pure, hand crumbed chicken breast. The chicken itself was well cooked (albeit slightly dry) and the crumbs on the top had a great crunch to them, although the bottom was a bit soggy for my tastes. Nikki, on the other hand, got napoli and cheese. This is a bit of a gripe I have with places that have the option of a Traditional parma as well as novelties. Ordering the traditional does not give pubs carte blanche to be boring. The traditional at the Wood 'n Chimney is the same price as the Mexican, yet it was woefully under-topped in comparison. For the same price I would have expected at least a slice of ham. More cheese, more napoli. "Traditional" isn't "plain". Either get creative or drop the price of the traditional as, as it stands, you're punishing people who like their parmas without a bunch of extra stuff piled on top. We shared bites of each other's parmas to get a feel of what the other was enjoying - Switching from the zesty salsa of the Mexican to the napoli was strange, and really highlighted how sweet the nap on the traditional parma was, not quite an asset. The chips were pretty standard, well cooked but not a huge serving - We didn't have to ask for the sauce pot, it just came with both parmas - that was definitely appreciated. The salad was fresh, crisp and loaded with onion, just how I like it - However it seemed as they had drizzled it with dressing while it was on the plate, as opposed to tossing the dressing through in a separate bowl - as a result the top layer was tasty, but the stuff underneath was a dry disappointment. I Enjoyed my parma at the Wood 'n Chimney, if I found myself hitting up a movie at Hoyts I'd definitely have no qualms stopping in for dinner - but at this stage I'd stick to the novelties as the traditional just doesn't quite cut it - but if you're after a cheap feed with a quality schnitzel it's worth popping your head in. Napoli on the traditional was far too sweet.